Old Sena vs new senas! Just purchased the sena smh10 after hours of looking at reviews and forums to decide if i wanted to go with the 30k or the 20s. My old 3s sucked, never paired with other 3s and broke after a season and half. A lot of my biker friends have the 10 and never had issues with it. Havent got much riding in yet. But im happy with the ease of operation and simplicity. Alot of poeple have been having issues with the newer ones so i went with old faithful! And you cant beat the price! The toggle dial is twitchy. Too many times I ended up rotating it when pressing it. As well, the volume feel is weird; it keeps on turning so you have no idea how much you have turned up the volume or whether it has more to go. Sound quality is lacking. My biggest gripe -- and it has been costly to me -- is that the physical connection of the cable to the speaker is very weak. I have been very careful installing these units, yet three times a speaker cable has pulled out of the speaker housing. It is not "welded" in; the only physical attachment is the solder joint itself. Moreover, I have called or written SENA several times over this and they either don't returned my clal as promised, or when I call again, that have no record of my earlier call. The technical support line seems to be staffed with ill-trained people in out-outsourced call center. I'm giving Cardo a try. Yesterday I purchased the Sena smh10. I previously owned a uclear amp go but just got a new helmet and was tired of my friends ragging me about my cheaper Bluetooth. I got to ride for about 6 hours today with the Sena, and this is probably the worst Bluetooth I have ever owned personally. First of all the speakers have absolutely no bass at all so listening to music is definitely not enjoyable. Next as far as Bluetooth communication goes I'm not very impressed as this unit does not even read text messages to a rider. The Sena app is a complete joke and provides no information on the ride such as available battery. Lastly, the volume on this unit is horrible. Anything over 60 miles an hour is barely audible and the more you increase volume the less clarity you have. I don't know who they paid for all these great reviews but they certainly did not pay me and I'm very upset after spending almost $200 for this unit with tax and the 2-year warranty. I will definitely be returning it tomorrow. I've only used it for a couple days. It's really easy to install (at least on a Shark evoline 3), probably also depending on the helmet. However I'm still trying different options for the mic. Boom mic doesn't fit very well, and wired mic is more designed for a closed helmet. I was quite disapointed with the audio quality when listening to music (using pandora app). That's probably what you can expect for the price, but it's basically only mediums. No bass, no treble, just medium. Sound while calling was okay. I've also had some malfunctions, like the system went off for no reason. I could switch it back on, but still had to pull over to hit the play button. Final word is, it's okay for the price but don't expect too much of it. Works as advertised and exceeded my expectations. First Bluetooth communicator. Ease of use and pairing to phone a snap. This system Installs easily in a modular helmet. It's fairly easy to use and pair with your device. While talking on the phone people don't even know I'm on my motorcycle. The negatives are this. It's expensive. And the music quality is lacking. There is very little bass. With the quality of other Bluetooth standard headphones, this should not be an issue. Had purchased another Bluetooth for my wife and I to use on our Can Am Tryke. We weren't satisfied so I bought the Sena SMH 10 and have experienced ease of conversation and the music clarity is differently acceptable. A little more bass would be nice. My wife and I recommend this product. You won't be disappointed. Greatly simplifies playing music and allows commo between fellow riders. Big improvement. Battery life is excellent too. Its a great product. I missed one, from a pair, and now replacing them. Sena I feel are the best headsets. I tried a few others, but have gone back to Sena. They work well and hold a charge for days. I'm doing a trip with another rider and wanted to be able to communicate with her. She recommended it. referral from a friend who uses one. He likes his and we will be able to communicate when riding.. I bought a GPS with Bluetooth capabillty. Because i need to listen to Brittney Spears when i ride. So the wife and I could chat while on longer rides and so she could tell me to slow down verbally instead of whacking me on the back of the head. Communication is essential during group riding. And when solo, I use it for bluetooth music & taking calls. Invaluable! I'm going on a trip from Nebraska to Oregon and back with my dad, so I bought this headset so we can have talk and so I can listen to music. Good piece of tech. Far more advanced than the old original chatter box. It takes a little getting used to talking at a normal volume as opposed to trying to yell over the bike. Ratings and reviews were very positive. It has been great. Wanted simple controls to listen to music and take phone calls while on my bike. Taking a motorcycle trip in Italy and would like to have good communication. Simple to use and rugged for long lasting use. Gotta be able to listen to Rush Limbaugh - need my daily dose, even when out riding. Actually got it for the turn-by-turn directions provided by Sygic, which is my go-to map program for programming my own routes. Satisfied with it. Fairly easy to set up and update. Just wish I had known the SMH10 FM was coming out so soon after I bought this one. But works very well with Spotify etc. as you as you have a large enough data plan. Quality first, style second and I liked your review of the product. Thank you. This is the second try. The left speaker quit within the first hour of my first ride. Hope the second time around is better. Out the 2 day shipping too. All my wingmen roll with this. Needed to listen to music with any hassles!!! excellent piece of equipment from Sena!!! I love it!!! Easy to use as well!!! The Sena SMH10-11 is quickly becoming the standard in helmet communication device for Arborist. It with stands the day to day abuse we give them and it makes the work area much safer when we can all hear each other. No more yelling over the equipment or giving hand signals to the crane or ground crew. Great headset. Pairs well with up to 3 riders. Use it for music and navigation as well. Friends who have used this spoke very highly of them. I finally buckled and got one for myself. The ability to take phone calls while riding, as well as communicate with other riders, has proven more useful than I'd thought. Easy to use and has crystal-clear sound. great quality, value for price, researched product. I needed another one for my husband. Works great and very easy to install. After using my friends Sena i realized how much simpler it was to use then my scala rider so i bought a Sena and am selling my scala. trust me if you need/want a communication device then buy the Sena its worth it just for the ease of use. the Scala is very frustrating and too complicated to mess with on the ride. Sena is a reputable company that makes great products. Several of my riding buddies have these and it makes group rides more enjoyable and safer. Also, not having to wear earbuds to listen to music is a big plus! How does the main "console" part of the device remain attached to the helmet? Is it a clip and/or adhesive? Will my FF helmet need to be modified in any way in order to attach/use this product? BEST ANSWER: The "console" unit snaps onto a base plate. The base plate has two mounting options A- Double-sided foam tape. B- A small clamp that slips between the outer shell and the foam liner of the helmet. I used the clamp to mount the base plate to my Arai XD3 because it seemed more secure than foam tape. No modifications were necessary to my helmet. It does not scratch or leave any permanent marks on my helmet. Call or write to customer service regarding your specific helmet. I like my SMH10 a lot. Hello there, no modification to your helmet is necessary. The main Bluetooth unit attaches by a clip that slides between the helmet shell and the neck roll or check pads. It's very secure. Also, if you want to, you can permanently attach it to your helmet by using the adhesive mounting clip that attaches to the outside of the helmet on the outer shell. I didn't permanently attach mine because I wasn't sure if I'd be keeping the helmet or not and I didn't want to lose resale if I sold it. Hope this helps. The main "console" piece of the unit is always attached to the helmet. (The main "console" piece is the part under the oblong piece with the blue light and round knob.) This device attaches to the a full face, flip up, and I believe a three quarter helmet. it attaches with adhesive strips (If I remember correctly.) And it is double tightened with two screws and a back plate that goes inside the helmet under the padding. I hope this helps. Also if you didn't look already see the video on revzilla. Long story short, it attaches with a clamp, no permanent modification is necessary. Type Sena SMH installation into the search bar at you tube, and you'll get a couple of install videos that will answer all your questions and more. The main retention has a clamping clip with two bolts to tighten, this holds it on. IIRC you could also do double sided tape. The controller slides into this. Great device, and Sena is very responsive to customer needs. Will it install and work well on a half helmet? BEST ANSWER: The honest answer is I don't know. Probably? I only wear full face helmets. I can tell you the SMH10 worked AWESOME for me and my buddy. We love this unit. Sound is clear, loud, even with earplugs in. Range is acceptable, about a mile line of sight. In canyons,'twisty rolling terrain you can lose each other pretty quick. But we ride close mostly and it wasn't an issue at all. So many benefits being able to communicate so effortlessly, on technical backcountry dirt roads, through busy cities while navigating. Really helped us dial in our riding style. Also battery life is superb. Easily got two FULL days of riding talking constantly. This product, the SMH10-11, is not recommended for half helmets as there is usally no place to attach the speakers and the microphones. The Sena headsets that are recommended instead for half helmets are the SPH10H and the SPH10H-FM. If you have a place to put the ear speakers, yes it's a good Bluetooth headset. But warning! If you have a Harely forget it. Harley Infotainment systems do not work with wireless/Bluetooth systems!!!!! In a full face helmet, the microphone is somewhat protected from wind noise. I think wind noise would be a problem with the microphone with only a half helmet or even an open face helmet..
does this product have the outlet to plug in ear buds? BEST ANSWER: No. it only has the charging outlet. I bought this product about 4 months ago and it works great. Good sound, holds a long charge, and the microphone is very clear even at 70 mph. No there is no output for ear buds . There is a 3.5mm input jack for a MP3 player or other non Bluetooth device and there's the charger port that's it. No, you have to purchase the different mount unit that ear buds will plug into, in addition to this unit. You have to buy the other unit with the boom mic as an additional piece. I love my SENA! The only plug is for MP3 input. The supplied speakers work very well for music. I don't believe so, I just installed it in my Shoei Neotec without checking. No, but you can order a mount that does accept a jack for earbuds. This helmet set does have an MP3 port on the part of the unit that attaches to the helmet. The control unit must be attached the the helmet piece to work. The control unit is not where the MP3 port is. It does, but I haven't tried it, since the bluetooth to iPhone/iPod works great. Also has the ability to charge the unit while riding. Very important to some of us, who like to get far away from everywhere, where plugging it in at night is not an option. Can you easily pull the unit off the helmet when you park? I usually don't carry my helmet and leave it locked to my bike. BEST ANSWER: Yes you can. The unit is two pieces. One that houses all of the circuits and one that is essentially the docking station. The docking station is compression locked to your helmet and the mic and headphones mount to it. The you just click on and off the expensive part. Sena SMH 10 Stays pretty secure when on the helmet!! If somebody wanted it and did not have the little tool.. they would prob have to break the helmet to get it.. The SMH10 "brain" module clips off easily and can be stored in a locking saddlebag. I have 2 helmets and use one module between the two. Works great. Charge every few rides. Love it. Yes, you can remove the module off the side of the helmet easily and stick it in your pocket. Yes. There is a release tab on the top so you can pop the main unit right off. does smh10 have an fm tuner in it ? The SMH-10 does not have an FM tuner in it. Just as an FYI it does have a high level of functionality that surpasses other "high end" units. Example: Schuberth. No. But if you have iHeart Radio or something comparable, you can listen to your smartphone through the headset as you go. Podcasts, too. This unit does not have an FM tuner. I don't believe that it does have a tuner. I listen mostly to slacker and Pandora via Bluetooth only. How reliable is the sticky mount? My helmet padding is non-removable so I wouldn't be able to use the clamp. I don't feel like dropping $160 on this only to have it fall off my helmet. BEST ANSWER: Hi, if you're referring to the sticky mounts for the speakers and mic, they work great. I have been using this unit for 10k miles worth of riding and have zero complaints. All of my components are still in their original placements and have not shown any signs of failure. Worth the price if you ask me. You shouldnt have to remove the helmet padding to attach the clamp mount. It has a plate that slides up between the shell and the foam of the helmet and the screws are on the bottom. Installing the speakers without being able to remove the padding will be the bigger issue. I've had mine attached with the "sticky mount" for almost two years now with no problems. Now the stickyness of the speakers is another issue. I've had to replace the supplied velco with 3M replacements after a year. I would put a dab of clear silicone on the tape and stick it on the helmet. Tape it in place until the silicone sets up. I use this method on many different items and it has never failed! I've had mine for a few years now but don't even remember having a sticky option. Ensure you explore all the market has today. Speakers are weak. Intermittent issues with cutting out pandora. . I have had this unit on my helmet for over a year now with the sticky mount and it is still rock solid, even at speeds up to 100 mph. Sorry, I've only used the clamp. How will this unit connect with other brands? Firmware upgrade from what I am told but where are the instructions on how to do it and is it difficult? BEST ANSWER: SENA makes it easy. They have a little program you put on your computer that streamlines the process. In fact, theres a firmware update out now for it. As far as comnecting woth others I believe you can walkie talkie with other headsets and the instructions are in the box, the software and, on thier website. The SMH10 is able to be paired with other non-Sena headsets out in the market after updating the firmware to v5.0 which will add the Universal Intercom feature. For instructions on how to use the Universal Intercom feature, check the v5.0 User's Guide in the Support section under Documents. How many non-Sean headsets can it connect to at one time? It doesn't connect with other brands... connecting with other SENA units works fairly well; takes a few attempts sometimes, connects right up sometimes... but if your friends run other systems, you should get that system. It's unfortunately, not a universal com protocol at this point. Don't know about brands but it connects fine with my Android phone. Just updated my headset's firmware to 5.0 easily with no problems. Instructions on how to do it are in the user manual that can be viewed or downloaded from the Sena website, it you don't already have a paper copy. As far as I can tell, these do not communicate with other brands. As for firmware updates, it's super easy. This thing just works, while it looks bulky, you will appreciate the ease of use. Good luck! Not sure on each individual brand, but a friend of mine has the Sena SMH10R and it links up just fine. BEST ANSWER: Yes. If your version has a micro usb connection. Sena has not created an application for 10.8 (mountain lion), but 10.7 does work in it's place. It is a bit cumbersome. You will likely have to change security settings of your mac to allow the install as Sena is not a Mac or affiliate developer (I had to do this, then reverted back to a safer setting). Sena provides a video on how to update or you can find it on youtube. Current firmware available as of 10-7 is 4.1.1 and I purchased mine with 4.0. I don't see a reason to upgrade until technology changes or Sena publishes a need to do so. I did not gain anything other than access to change default settings for various things. I chose to keep the defaults, imagine most would do the same. Yep, I installed the mac firmware upgrade application and it worked fine. Sme have experienced problems with Bluetooth on their mac after using, but I had no problems. Have upgraded and downgraded successfully (4.1.0 -> 4.1.1 -> 4.0 -> 4.1.1) trying to sort out Bluetooth problems that turned out to be iPhone 5 Bluetooth problems. Yes, I only have a mac and followed the instructions and the did the upgrade flawless. The Sena SMH10 does have the ability to be updated using certain versions of the MAC operating systems. Currently, Sena offers a software manager on their website for Mac OS X Snow Leopard 10.6 and Lion 10.7. On a related note, the Sena SMH10-11 is the same exact device as the regular Sena SMH-10. 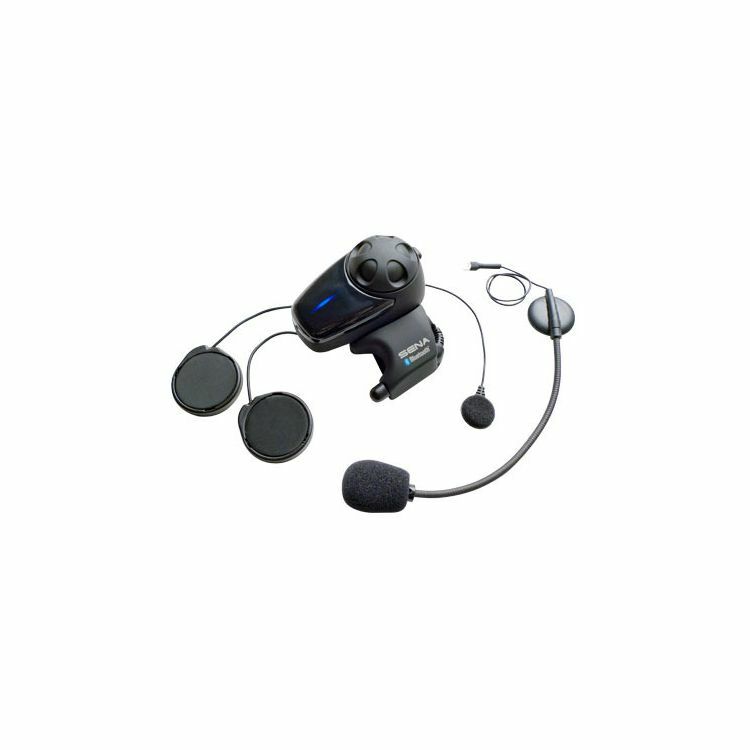 The difference between the two kits is that the "universal headset" comes with the "Sena SMH-10 Helmet Clamp Kit - Attachable Boom and Wired Microphone" instead of the "Sena SMH-10 Helmet Clamp Kit - Boom Microphone" that is included in the regular SMH-10 (see linked products below). The "Sena SMH-10 Helmet Clamp Kit - Attachable Boom and Wired Microphone" that comes with the SMH10-11 allows the user to mount the clamp further back on the helmet shell. This is ideal for a helmet like the Schuberth C3 for example, which has the slider for the internal sun-visor located on the left side of the helmet where the regular "Sena SMH-10 Helmet Clamp Kit - Boom Microphone" would be mounted normally. The "Sena SMH-10 Helmet Clamp Kit - Attachable Boom and Wired Microphone" that comes with the SMH10-11 allows the user to mount the clamp further back on the helmet shell. This is ideal for a helmet like the Schuberth C3, which has the slider for the internal sunvisor located on the left side of the helmet where the regular "Sena SMH-10 Helmet Clamp Kit - Boom Microphone" would be mounted normally. can this device be used without a cell phone? BEST ANSWER: Yes, absolutely. In fact many of us don't like answering/ making phone calls while riding. Music is also a personal matter and you can source your tunes through any number of other devices such as a GPS or .mp3 device. The intercom feature doesn't need a cell phone. The system does not require a cell phone. Communication between riders works totally independent of cell phones. You can link a cell phone to the system through Bluetooth if you want to make an outside phone call while you are riding. Yes. It is a stand-alone communication device with other similar devices in that scenario. Yes. On long trips I bring the man player and plug right in. Will I be able to hear the direction commands of my Galaxy S5 phone's GPS? BEST ANSWER: Hi Elliott. I have an iPhone and I have no trouble hearing the GPS commands. I listen to music from it as well. Both through Bluetooth connection. The phone works well also. My side of the conversation is usually 'I'm on the bike. I'll call you when I stop'. I use Navigon (Garmin's GPS app) on my HTC One and voice directions come through perfectly.